Tilt angle slides easily to any position. 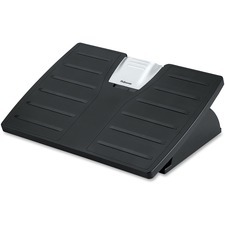 Easy-glide design allows instant repositioning of feet and legs. Width: 18 1/2"; Height: 5"; Depth: 11 1/2"; Color(s): Black. Tilt angle slides easily to any position. Easy-glide design allows instant repositioning of feet and legs. Width: 18 1/2"; Height: 8"; Depth: 11 1/2"; Color(s): Black.